Spacious family suites with Queen beds and sleeper sofas can accommodate up to 8 guests. Ideal for families traveling together. Room Features: 3 queen sized beds, pull-out sofa, private balcony with view, a fridge, and a microwave. • Located across the lawn from our main building (“The Lodge”) and the courtyard. Set apart slightly from the other buildings. 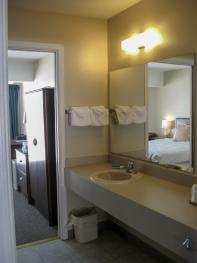 • spacious, one-bed rooms, with queen beds. 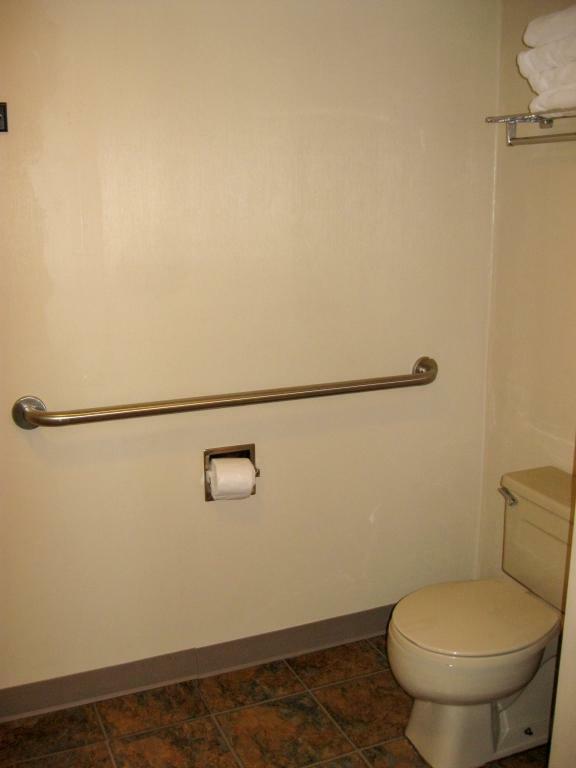 • All rooms are on ground floor with parking directly outside your door. A popular choice for guests who prefer no upstairs neighbors. • Motel-style with rooms all-in-a-row. • The Pines does not offer lake or courtyard views. Room Features: Lower Floor, Parking directly outside the room, 1 Bed in the room. 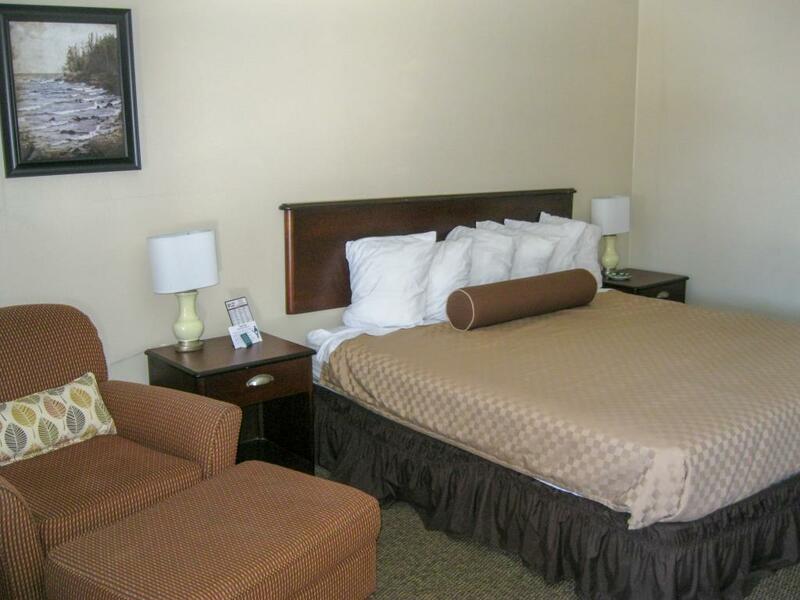 Contact our front desk with requests or questions about bed sizing (906) 643-9900. 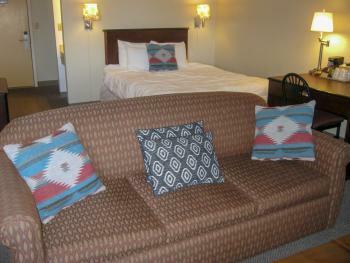 Room Features: Upper floor, 1 Queen sized bed, private balcony with a view. Room Features: Lower Floor; King Bed; Jacuzzi jetted tub; In the same building as the Lobby, Hot Breakfast, and Pool; Interior access hallway. 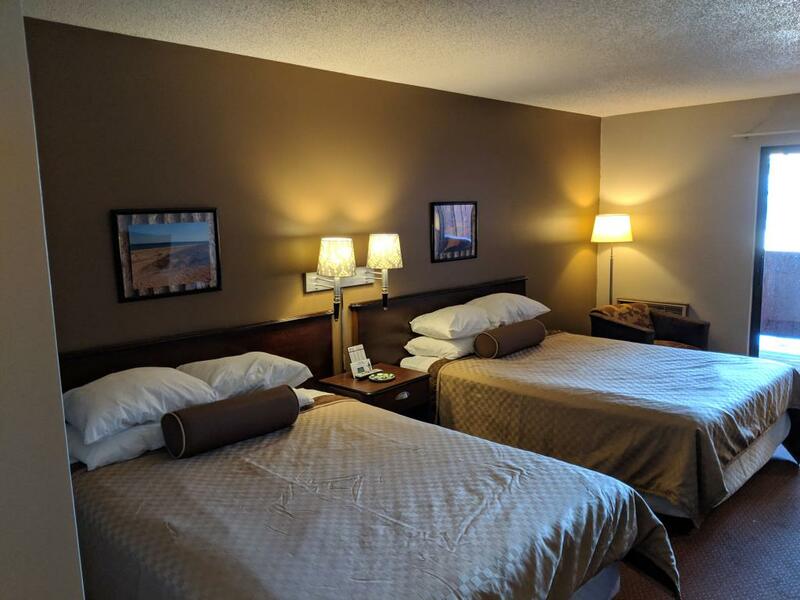 Room Features: Parking directly in front of the rooms, view of the bonfire pit and courtyard gardens, view of Lake Huron. These rooms are pet friendly. • Offering excellent views of Lake Huron and Mackinac Island. 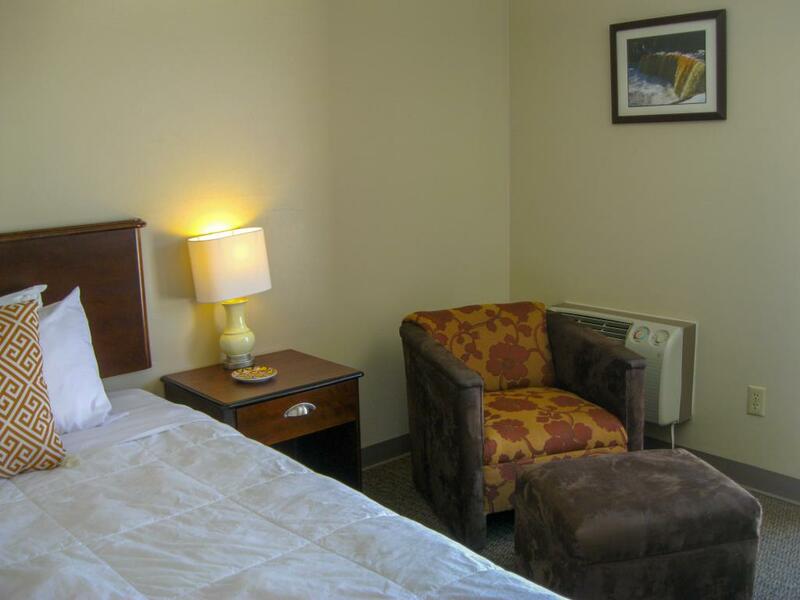 • Rooms overlook our large lawn and bonfire area. • Second-floor rooms feature common balconies the length of the building. • First-floor rooms offer parking directly outside your door. 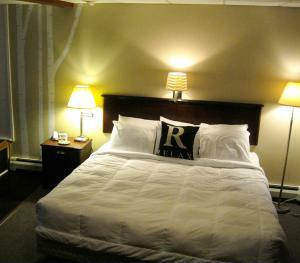 • All rooms have two Queen beds. • With easy outdoor access, The Cedars is convenient for guests traveling with pets. Room Features: Lower floor, parking directly outside the room, sliding glass doors to overlook the lawn with a view of Lake Huron and Mackinac Island. • Featuring our best views of Lake Huron and Mackinac Island. 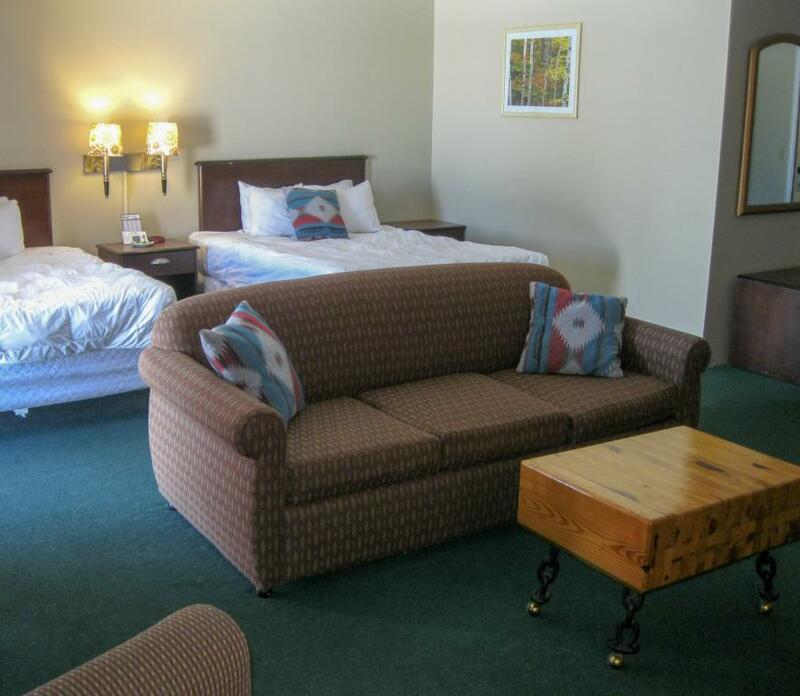 • Right next door to The Lodge, and convenient to pool and hot tub, breakfast room, lobby and front desk. • Rooms overlook large lawn and courtyard and all have outdoor sitting areas. • Room types in this building: Rooms with 2 beds, Jack-and-Jill suites, plus family suites. Some adjoining rooms. • Second-floor rooms have balconies (some shared and some private). • First-floor rooms offer parking directly outside your door. 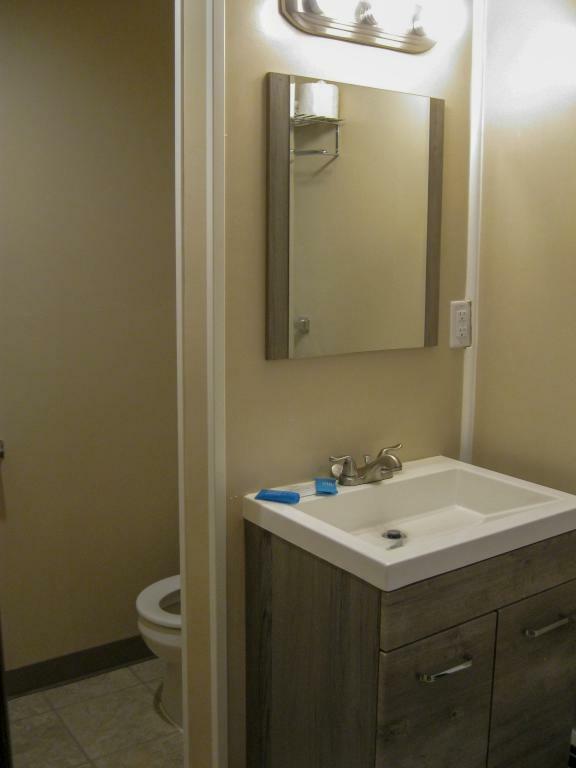 • Some first-floor rooms are “Jack and Jill style”—which means 2 separate bedrooms separated by a connecting bath and vanity area; sliding pocket doors. Ideal for two couples traveling together, or maybe Mom and Dad traveling with one or two children. Room Features: Lower Floor, Parking directly outside the room, 2 separate bed areas with doors to separate the spaces, glass sliding doors directly to the lawn with a view of Mackinac Island and Lake Huron, • Featuring our best views of Lake Huron and Mackinac Island. • Right next door to The Lodge, and convenient to pool and hot tub, breakfast room, lobby and front desk. • Rooms overlook large lawn and courtyard and all have outdoor sitting areas. 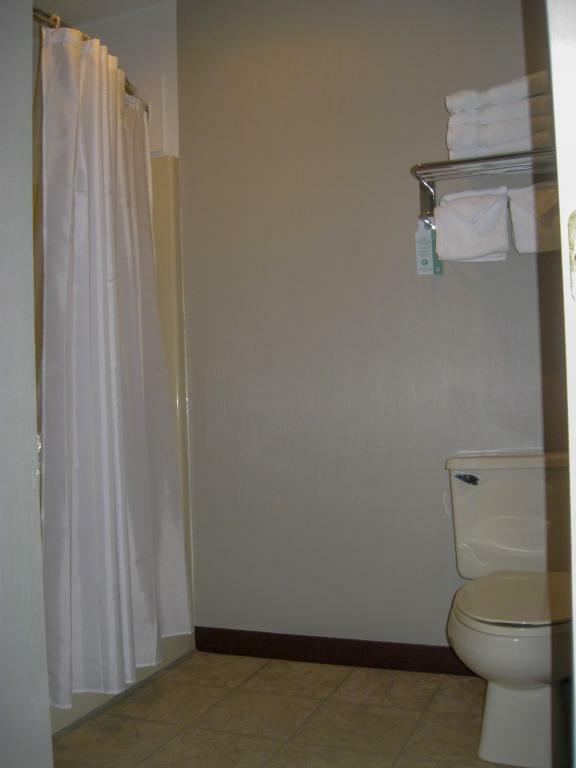 Room Features: In the same building as the Lobby, Hot breakfast, and Pool; Interior hallway access; 2 beds. Some rooms have private balconies. Some rooms have vaulted wood ceilings. 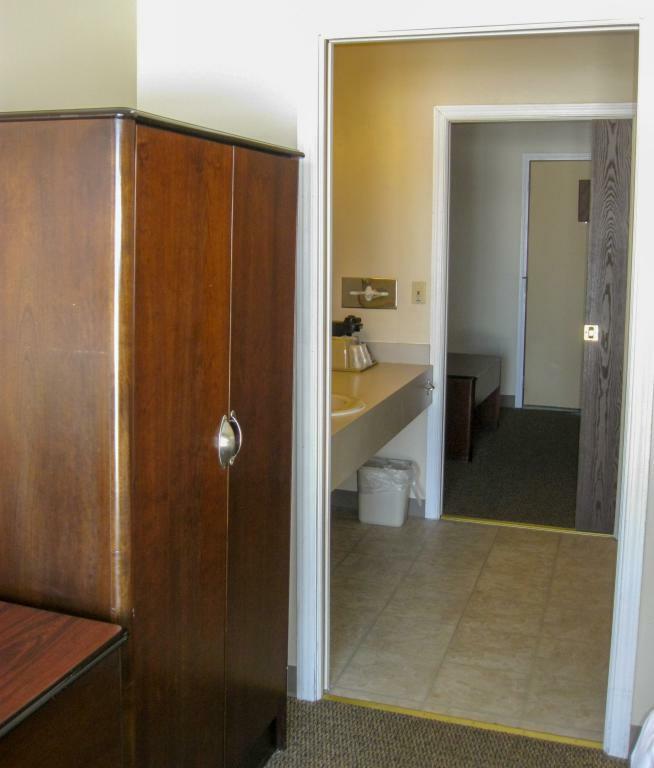 Call our front desk is you have a request about Lodge Double Room layouts (906) 643-9900. 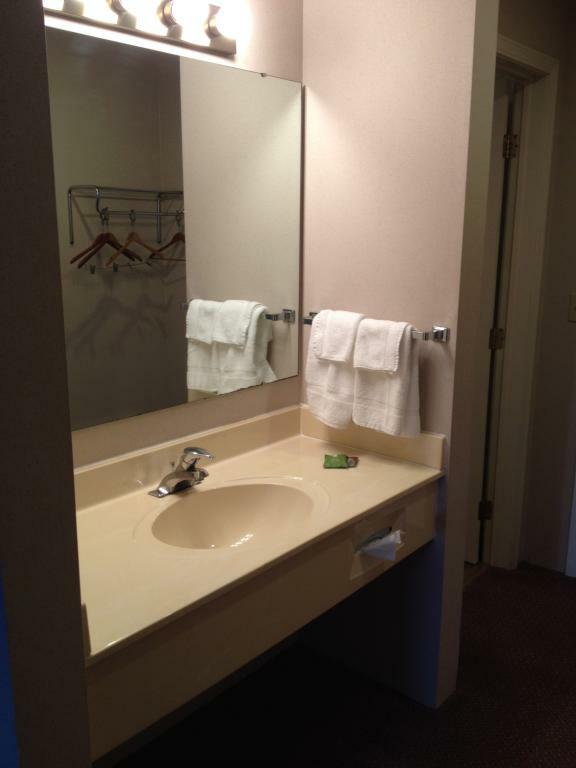 • Rooms are in the same building as pool and hot tub, breakfast room, lobby and front desk. 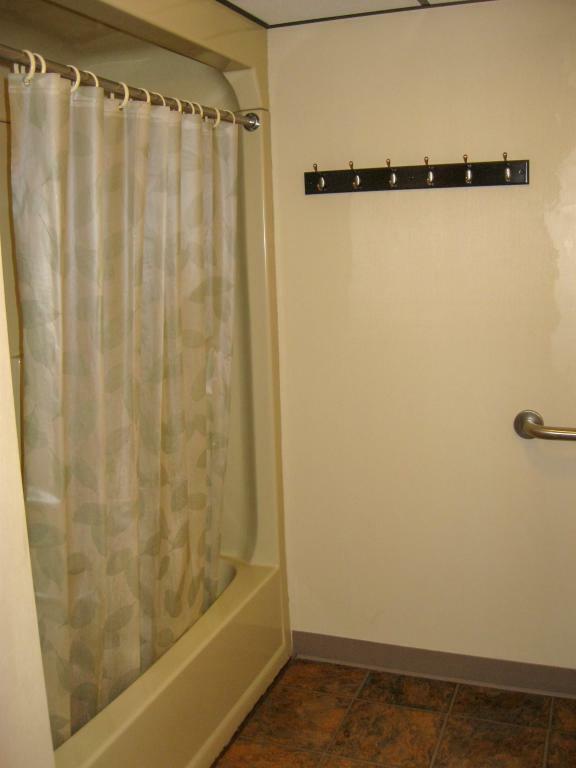 • Our most popular building for guests who want indoor proximity to the pool. • Lake views from some hallways in The Lodge, but not directly from rooms. 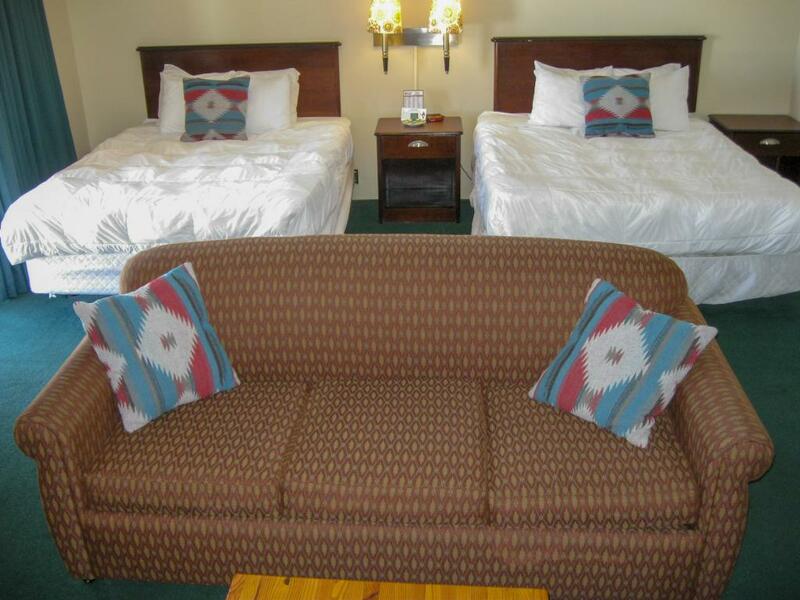 • Room types available in The Lodge are: North Wing rooms: 2 beds per room. Some suite style, meaning two separate bedrooms (no living room). Birch Rooms -- Cozy upstairs North Wing rooms boast unique vaulted wooden ceilings and hand-painted birch tree murals, adding real character to these special rooms. East Wing rooms: 2 Queen beds per room, featuring vanity area outside bathroom, all rooms with private balconies, no lake views. Some adjoining rooms available. Comfy and spacious. - Jacuzzi rooms feature jetted tubs and King beds. Cedar Hill Lodge offers nine acres on a hill overlooking Lake Huron and Mackinac Island, with four guest buildings. Please enjoy our large lawn and outdoor amenities. Come relax in the courtyard garden, with its gas grills and picnic tables and view of Lake Huron and Mackinac Island. Other features are a bonfire pit, volleyball and tetherball games, basketball hoop, and lawn games. In the Lodge lobby and breakfast room, enjoy the TV, DVD player, gaming console, computer station, and large bookshelf stocked with reading material, as well as family board games. Families often gather here for games, cards, or conversation – bringing in snacks and refreshments or take-out meals. Please make yourself at home! Our newly updated lobby and breakfast room boast a cozy "up-north lodge" theme...with special touches like hand-painted murals and a map of the Upper Peninsula marked with Eastern U.P. attractions...plus local favorites like the nearby Deer Ranch, Mystery Spot, Castle Rock, and the Sand Dunes beach. Free shuttles available to ferry docks and casino. We are a stop on the St. Ignace Trolley route. Grocery store across the street. Several restaurants within walking distance. Other nearby attractions: Chief Wawatam Park, Huron Boardwalk, downtown St. Ignace. Also: Sand Dunes Beach, North Country Trail, and Mackinac Bridge View Park. Popular travel attractions within approximately one hour travel time from our location include Mackinac Island, Sault Ste. Marie and the Soo Locks, Tahquamenon Falls, Whitefish Point on Lake Superior, The Big Spring, the Les Cheneaux Islands area, Pictured Rocks National Lakeshore. One mile east of Mackinac Bridge toll booths, on a hill overlooking Lake Huron and Mackinac Island. Take US-2 / I-75 Business Loop toward downtown St. Ignace.